In 1909 Gilbert Haven Jones became the first African American to receive a Ph.D. from a German university. 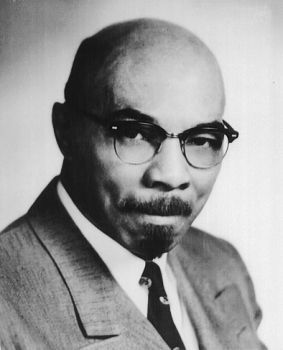 After completing his doctoral studies in philosophy, Jones returned to the United States to take up teaching and administrative positions, primarily at Wilberforce University. Jones was also the first African American with a Ph.D. to teach psychology in the United States. Gilbert Haven Jones was born in Fort Mott, South Carolina on August 21, 1881, to Bishop Joshua H. Jones and Elizabeth “Lizzy” (Martin) Jones. Bishop Jones held multiple positions in the African Methodist Episcopal (AME) Church and was also a prominent figure at AME-supported Wilberforce University. When Gilbert Haven graduated from Wilberforce with his Bachelor of Arts (1902) and Bachelor of Science (1903) degrees, his father was president of the institution. After Wilberforce, Jones took up a teaching position at the local black high school in Carlisle, Pennsylvania while simultaneously pursuing a Masters degree in philosophy from nearby Dickinson College. Upon receiving his degree in 1906 Jones traveled to Europe and studied briefly at the Universities of Göttingen, Berlin, Leipzig, Halle, as well as Toulouse and the Sorbonne in Paris before settling in at the University of Jena. There he successfully completed his Ph.D. in two years with a dissertation entitled Lotze und Bowne: Eine Vergleichung Ihrer philosophischen Arbeit (Lotze and Bowne: A Comparison of their Philosophical Work). Jones returned to the United States where he taught at Wilberforce and nearby Central State University. During his time at Wilberforce he was a professor of philosophy and psychology as well as Dean of the College of Liberal Arts (1914-1924) and the University’s fourth president (1924-1932). Jones’s dedication to education was solidified in his one book Education in Theory and Practice (1919). Therein he lays out the various techniques, pedagogical practices, and recourses necessary for a successful school system. Jones’s dedication to the field of philosophy and his recognition of its utility within education, psychology, and religion mark him as one of the most important African American philosophers of the early twentieth century. Jones married Rachel Gladys Coverdale on June 8, 1910. Their union yielded four children: Gladys Havena, born in May of 1911, Gilbert Haven Jr., September of 1914, Ruth Inez born on May 1, 1919, and Donald Coverdale born on October 1, 1921. Gilbert Haven Jones died in Chicago, Illinois on June 24, 1966. He was 85. Robert Munro, "The Dynamic Character of the Early African American Philosopher: An Intellectual Biography of Gilbert Haven Jones" (Ph.D. dissertation, Michigan State University, 2012); George Yancy, “Gilbert Haven Jones as an Early Black Philosopher and Educator,” APA Newsletter on Philosophy and the Black Experience 2:2 (Spring 2003); Gilbert Haven Jones, Education in Theory and Practice (Boston: The Gorham Press, 1919).